The clock hits midnight. A game moderator, with a blue bandana, stands up on a low wall. She taps a little orange button on HVZsource.com that she’s had pulled up and waiting for the past five minutes. “The game has begun!” she calls out.The bandana-clad humans immediately scatter, pelting each other with balled-up socks as they do. The semester’s game of Humans vs. Zombies has officially begun. Humans vs. Zombies, or HVZ, is a 5-day game of Nerf war and tag that occurs within the boundaries of UF’s main campus. Humans wear an orange bandana on their arm; zombies wear an orange bandana on their heads. Zombies try to tag humans with their hands and humans try to shoot zombies with Nerf blasters or hit them with balled-up socks. If a zombie successfully tags a human, the human puts away their blaster, puts their bandana on their head and joins the horde. If a human successfully shoots the zombie before being tagged, the zombie is stunned and cannot tag humans for the next five minutes. Every day humans and zombies get missions and objectives to complete that help further the game’s storyline. At the midnight mission that began the game, the humans scattered and threw socks for fear of an Original Zombie, or OZ–a zombie disguised as a human who begins the zombie apocalypse. However, give it a few days, and the horde grows, leading to the game becoming harder and harder to survive. When did the apocalypse hit UF? 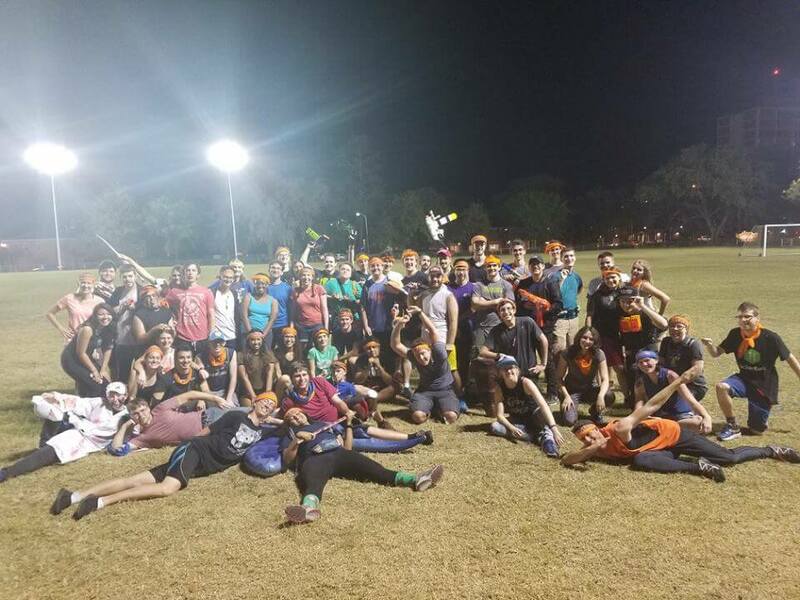 Alex Marques, a senior and the special projects manager of Gators HVZ, got into the club through a mini mission (a stand-alone mission that occurs for a few hours one day). Marques loved the people involved and felt like he had a distinct role in the game. “This game is competitive and it brings out some intense natures in people. People will try really hard in this very silly game, but you also see the true humanity in people,” Marques said. For junior Kathryn Burns, a current moderator for HVZ, the Quidditch team pulled her into HVZ. She stayed because she loves getting to run around with nerf blasters. “It’s not often that you can do this, especially once you’re considered a ‘grownup,’” Burns said. 3. “Have their ears out for all the tips coming from all the different people,” Shyamsundar said. “Be aware of these things so that your knowledge of the game improves quickly,” Shyamsundar said. There’s a traditional post-human vs zombies gathering. No matter if you’re a human, a zombie or a mod, we all end up in the same place–sitting at a ridiculous number of tables all pushed together in a Steak ’n’ Shake eating, talking and enjoying the company of the Human vs Zombie community (or engaging in an HVZ meme war. That happens, too).